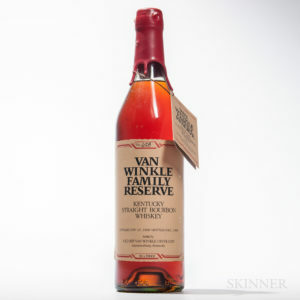 Skinner’s Expansive Auction of Fine Wines & Rare Spirits Presents a Variety of Exceptional Offerings | Skinner Inc.
Fanning in every direction, the June Fine Wines & Rare Spirits auction covers a broad scope of far- reaching distilleries, producers, and vintages. A wide array of single and small lots makes collecting from this auction especially varied, approachable and exciting. The online-only auction opens for bidding on Wednesday, June 21 at 10AM and lots begin a rolling close on Wednesday, June 28 at 2PM. The auction presents vintages that span over decades: from a bottle of Conterno Monfortino Barolo Riserva 1958, to the 2013 and 2014 releases of the much sought-after Screaming Eagle three packs in original wood cases. The geographical range is similarly broad. Wine specialist Anna Ward points to “an incredible selection of rare bottlings of Italian producers from a bygone era including Mastroberardino Riserva Taurasi 1968.” And the singular Vega Sicilia Unico 2004 from Spain is available in two original wood three packs (Lot 1500, Estimated between $1,200-1,500). In addition to the choice selection of wines, vintages from legendary producers of France and California are also well represented. To add breadth and depth to the cellar of the connoisseur, the auction includes full cases from top producers including Chateau La Tour Haut Brion (Lot 1162, $3,300-4,500). Previews for this auction are by prior arrangement with the department. 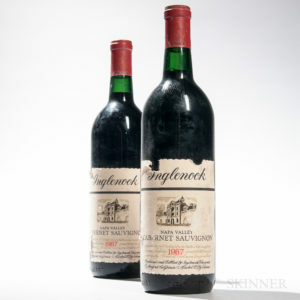 Please contact 508-970-3246, or e-mail finewines@skinnerinc.com, if you would like to arrange a preview. This entry was posted in News and tagged boston, Bourdeaux, burgundy, california wine, Chateau Mouton Rothschild, Domaine de la Romanee Conti, fine wines, french wine, Gaja wines, Glenfiddich, Italian wine, Japanese whisky, napa valley, Napa wine, rare spirits, rhone, skinner, skinner auctions, Very Very Old Fitzgerald, wine auction by Skinner. Bookmark the permalink.